My favorite coworker collects squid figurines in his cubicle. I crocheted him this in pink, my second favorite color. I would have loved to have had some crochet cotton on hand because the yarn is extremely fuzzy and un-crochet-like, but Portland was experiencing the SNOWSTORM OF THE CENTURY and the whole city was impassable. In my last days in Brooklyn, I actually came across this finished object at a fancy store in Park Slope. It was among some crocheted reef and a crocheted octopus. Jessica Polka also features those patterns on her Etsy page. It inspired me so much I took a picture! Jessica Polka’s work in Brooklyn. What else? 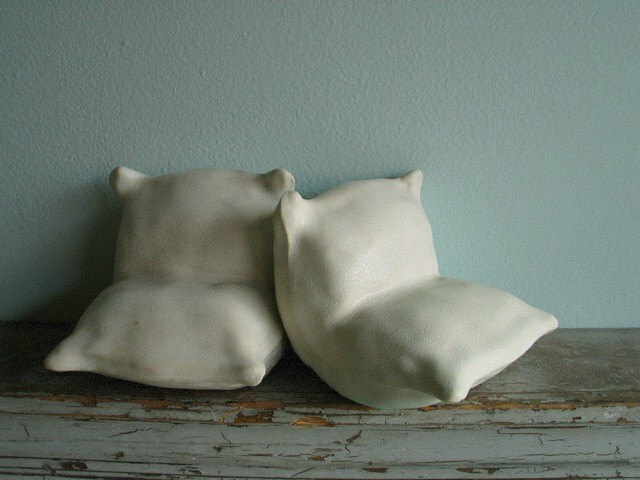 So speaking of Etsy, my friend Jack makes ceramic pillow bookends that I just adore. So check out his Etsy page!